A virtual reconstruction that blurs the borders between the interior and exterior of the exhibition space, the building and the surrounding blocks; the cityscape gradually changes into an imaginary constructed space that expands in all three axis. A project that investigates the artistic qualities of volumetric imagery; not generating a realistic three-dimensionality that represents reality as we know it, but finding a method to create imagery that can be described as dynamic sculpting with video. A work that completely absorbs you and gives you an intense full-body experience of pure motion by projecting images in your peripheral field of vision; straight ahead, in the central field of vision, all is dark. A 3D exploration of the cinematographic concept 'the forward travel' or 'the forward traveling-shot'. The work reverse engineers this typical cinematographic travel by not presenting the output of a moving camera but by putting the viewer inside the 3D-camera itself. An interactive installation where the visitor physically navigates through an audio-visual city landscape built up from 'point clouds'. These 'point clouds' are generated from online web 2.0 photo collections like those found in Flickr. 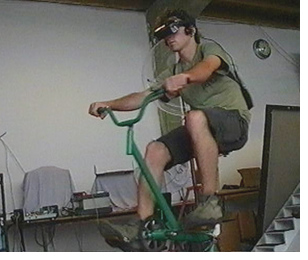 Sitting in a rotating chair the user is immersed in a 360 degree video landscape. Starting inside the exhibition space the user hovers through the various floors of the famous Philips building and ends up hight above the STRP-S district. A special version of the 360 degree video installation for the Cinekid festival. 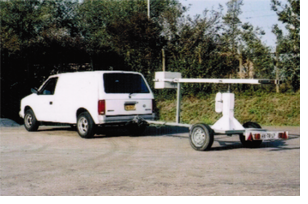 A circular track is fitted with a camera crane mounted with an independently operated camera. 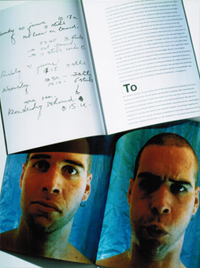 The camera lens imposes on public space, seeking out and scanning the visitor's facial features. Rather than identifying a person, the biometric video analysis software compares their characteristics with a preselected data base of "celebrity" faces. Equipped with biometric video analyzing software, the installation scans facial features and characteristics of anyone looking into its mirror and compares them to those of more than 250 preselected people in a database. Equipped with biometric video analyzing software, the installation detects and scrutinizes the faces of the people wishing to pass through the gate and enter the exhibition comparing them to those of more than 250 preselected people in a database. Proposal for a virtual walk through Newcastle: while walking over the floor plan of Newcastle, the visitors will trigger fragments from a deconstructed composition of 1700's composer Charles Avison these fragments are subsequently placed in a 3-D space, hence dynamically recombining them into a new contemporary composition. 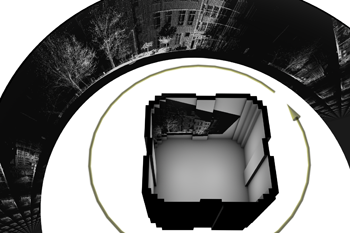 Project proposal for a site specific Immersive 360 degree 3-D pixel centrifuge. A rotating projector has already been envisioned at the original cadastral centre of the Dutch coordinate scheme: located in the heart of the “Onze Lieve Vrouwe Toren” in Amersfoort. Here, a projector casts 3-D point clouds on the inside walls of the tower. The development of the image is a dynamic movement from the inside of the tower to the inner city wall and on to the second city wall with the 3-D pixels finally resting in endless space. An immersive walk through Florence. The 3-D images are set rolling by the physical effort undergone by the viewer, revealing an imaginary and “poetic” Florence where true architectural shots explode into an infinity of pixels. While the visual world represented concentrates on the concept of emptiness; on the total absence of any human imprint; and on the sheer beauty of space, the acoustic element takes on a new dimension with a store of sounds registered in the city. An ongoing research project for an immersive art-game played in an existing physical space. The players wear a specially designed headset-display and a crash-suit. The more the players move, the more the existing space is visually taken over by an unknown virtual world. 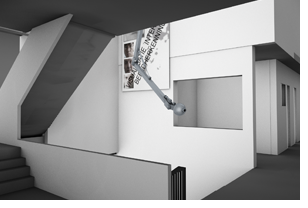 A design sketch for an interactive robot arm in a transitional space in the multifunctional public building: MFA in Maastricht NL. The robot scans the diverse levels of the stairwell area and by means of face recognition software builds a data-base of the users of the MFA. The arm reacts and makes contact with these occupants through movement, sound and image and becomes excited and happy when it recognises them. In this way, the installation offers the occupants a point of recognition in the MFA in the vein of dynamics and movement in a transit-space. 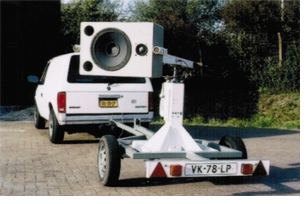 A proposal for a bill-board sized "flat-bed" scanner on the facade of the cultural meeting place Las Palmas in Rotterdam NL. The optical array moves along the building’s frontage and visualises the activities that take place behind the facade in realtime. An interactive experience where the physical body and visual perception is subjected to extreme rotational movement. An interactive installation whereby anyone in good physical condition may try his or her luck in a virtual city projected on an enormous 8 x 4 metre screen. The distance you run on the conveyor belt is the same distance you will cover in the imaginary world in front of you. 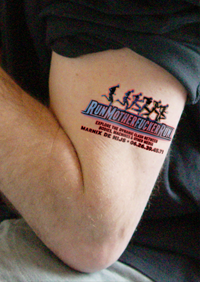 A self determined progression in an atmosphere somewhere between a thriller chase and urban horror. An autonomous reserve of oil intended for exclusive use in non commercial or non political projects such as art or science. In order to protect this commodity it is equipped with a self destruction mechanism that will blow up the reserve if somebody tries to steal or obstruct it. Not only by communicating with each other directly but also through the two large hovercraft objects each player in this game has their ‘own’ playing field with their ‘own’ interactive craft. The movements of one will be controllably copied by the other and vice versa, creating an almost Tai Chi like confrontation at a distance. 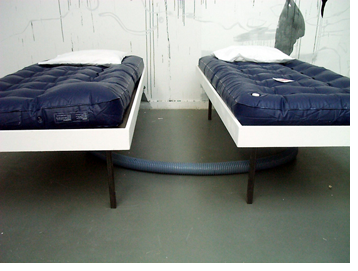 Two separated air beds that are connected with large hoses that enable the users to feel each others movements from a distance. 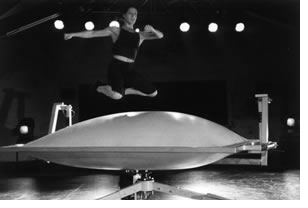 A dance performance between dancer and a sensor equipped mechanical partner. The movements and sound of this interactive object were manipulated by exploring the space around it and by direct physical contact through human interaction. Interactive mechanical dance partner used both in a performance setting as well as in an stand alone installation. 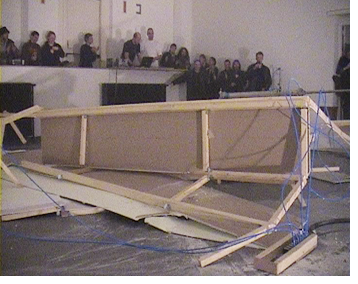 Destruction of the remnants of an exhibition with sound pneumatics using speakers. 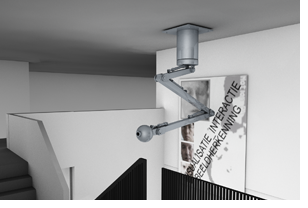 A game of attraction and repulsion between machine and visitor whereby a speaker attached to a rotating arm builds a physical and tangible bond with human element. 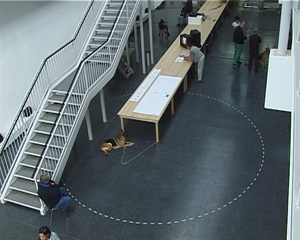 The sounds and movements experienced entice the public to move through the space and interact and explore the object. 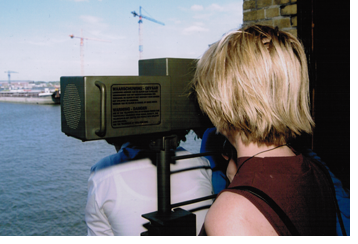 A site-specific telescope that manipulates reality. An expressive interaction between three dogs making comment on a debate over the changing position of art within Europe. 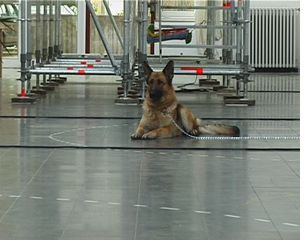 Three pure-bred German Shepherds were chained at three different locations in the space. These locations were their territory to protect during the debate. Knocking out the wall of a concert hall with air-cushions. Interactive experiments with extreme rotational movement forced upon the physical and visual perception. Experience installation that seeks to explore the possibility of influencing our visual perception of speed. At exactly what price and what length will we go to in order to perceive an image? Intrusively invading the public domain with audio-visuals of the stalker Bob Lee. National Institute of Justice Level 3: magnum 9mm point blank range protective lingerie. 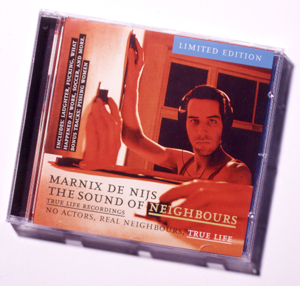 Video / photo-installation and book depicting self-portraits and neighbour-peeping pictures side by side. 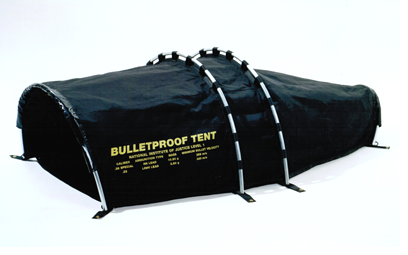 National Institute of Justice Level 1: protective camping-gear. A machine that sets an entire building in motion through vibrations. 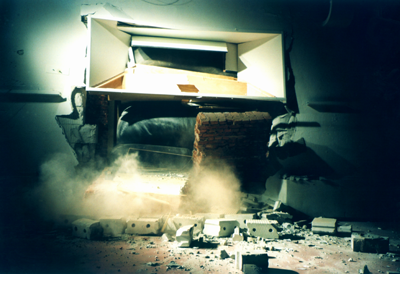 Use of this device will consequently result in the ultimate destruction of the building.